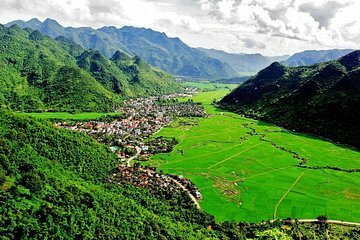 The stunning rural landscapes and ethnic minority villages of the Mai Chau Valley lie just west of Hanoi. On this tour, journey along the scenic Thung Khe Pass; trek to villages belonging to the Muong and White Thai people; and experience local life during a homestay in Pom Coong village. Pickup and drop off at hotel in Hoan Kiem District only. Pickup or drop off at other locations is subject to the availability and will incur a supplement surcharge. This program tour is not fit your requirement? Feel free to contact us to plan this trip and get the best possible price based upon your travel period and specific touring needs. Please provide us the valid email and valid mobile phone number because the confirmation will be sent to you via the email you registered and the mobile phone number will be contacted in emergency.